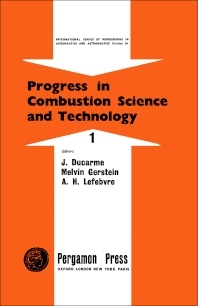 Progress in Combustion Science and Technology, Volume 1, is the first of a series designed as a means for publishing annually in one volume a number of review articles which are primarily concerned with the aeronautical aspects of combustion and propulsion. The main emphasis of the present volume is combustion, with contributions from authors who are themselves active in this field. In future volumes the scope will be widened to include articles on aircraft and spacecraft propulsion. The volume begins with a discussion of flow visualization techniques. It puts into perspective the developments in techniques which are particularly applicable to the flow of air and gases through such equipment as industrial furnaces and engine combustion systems, and to point the way to applying the experience we now have to the best advantage. Separate chapters cover chemical analysis in combustion chamber development; aerodynamic influences on flame stability; geometric-optical techniques in combustion research; flame quenching; and ignition in liquid propellant rocket engines.